WHAT: Concrete delivery (7-10 trucks) and concrete pump truck for installation of Service and Inspection Building hoist pit foundations. WHEN: Monday - Friday, August 8 - 12, 2016 between the hours of 6:30 a.m. and 12:00 p.m.
WHAT: Import fill material from off-site location (Savy Site, Ashburn). 100 - 150 truckloads of fill material will be delivered to project site. The imported fill material will be used to replace Unsuitable Material that was found on the project site. All Unsuitable Material will remain on MWAA property and stockpiled.Concrete delivery (7-10 trucks) and concrete pump truck for installation of Service and Inspection Building hoist pit foundations. 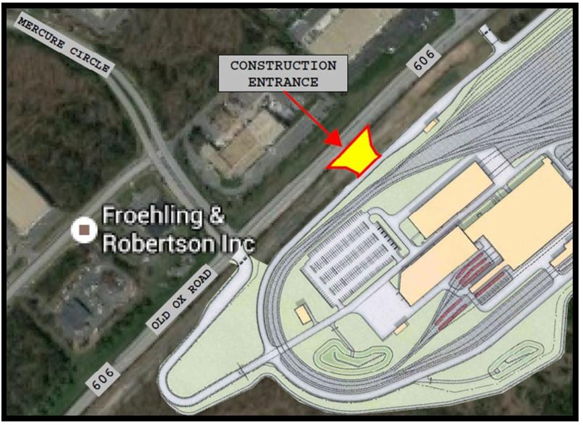 WHEN: Between the hours of 7:00 a.m to 4:00 p.m.
HOW: Trucks will travel from the Ashburn Site (near Verizon complex off Waxpool Rd.) via Red Run Dr., Waxpool Rd. (Rt. 625), South on Rt. 28, Old Ox Road (Rt. 606). Return trip will be Old Ox Road (Rt. 606), North on Rt. 28, Waxpool Rd. (Rt. 626) and Red Run Dr. Roads will be cleaned during import fill operations by a sweeper truck.